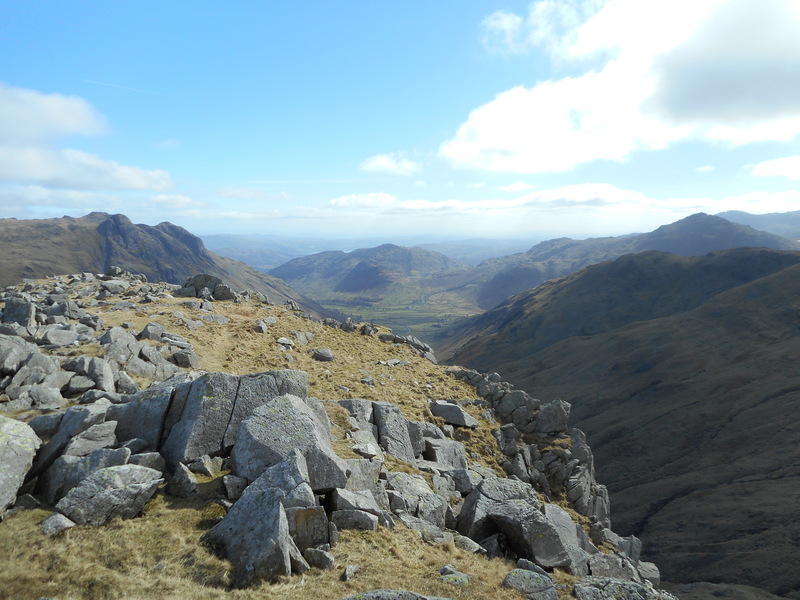 Waking up to the forecast bright and sunny morning, plans were quickly made for a round of Bowfell and Crinkle Crags, with the option of Pike o’ Blisco if time and energy allowed. 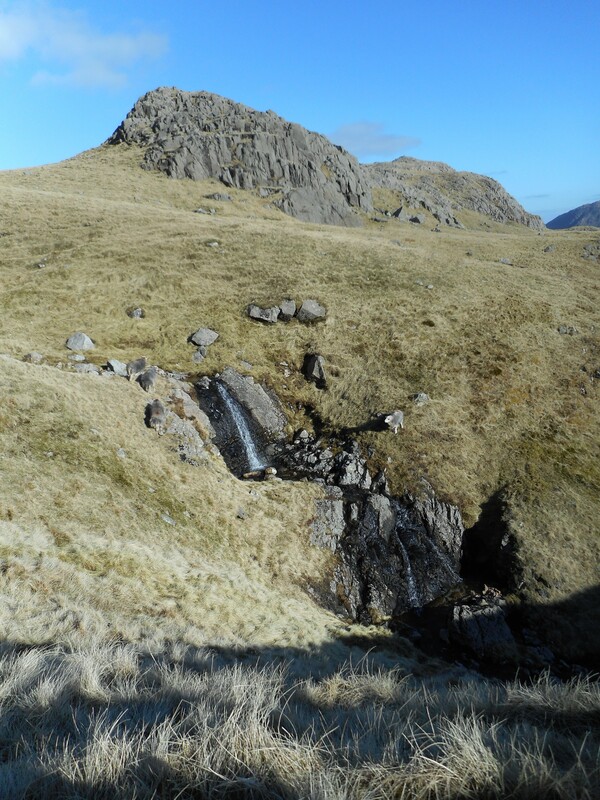 We left the hut at around 9 am, making good progress along Mickleden and up the excellently repaired path that zig-zags up the slopes to the side of Rossett Gill. 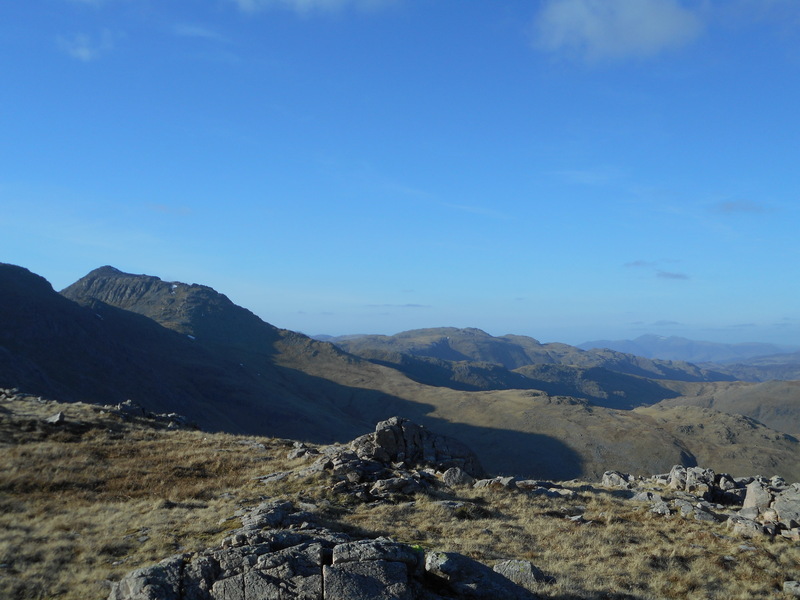 What little cloud there had been first thing was rapidly burning off by this time, boding well for the views from the tops. 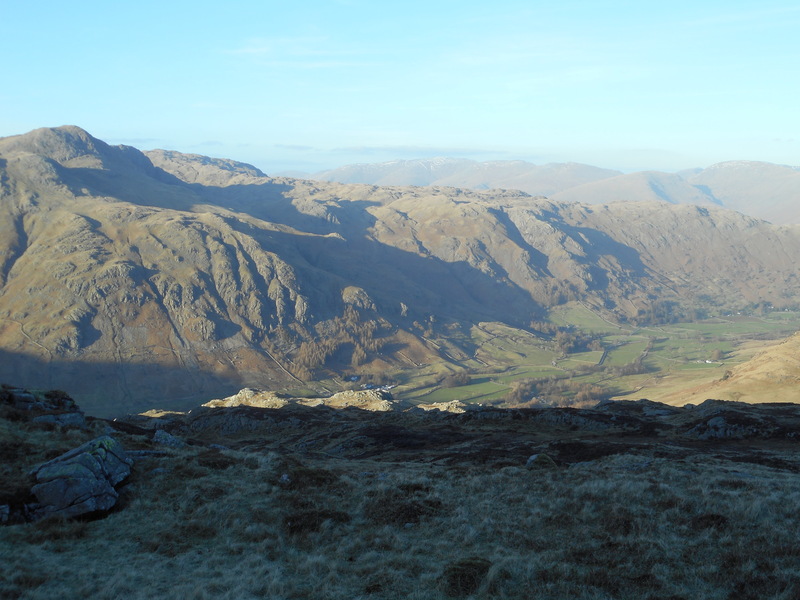 After a quick breather at the top of Rossett Gill, we decided to make a quick out-and-back to Rossett Pike (2136 ft), as this was one of Keith’s outstanding Wainwrights. 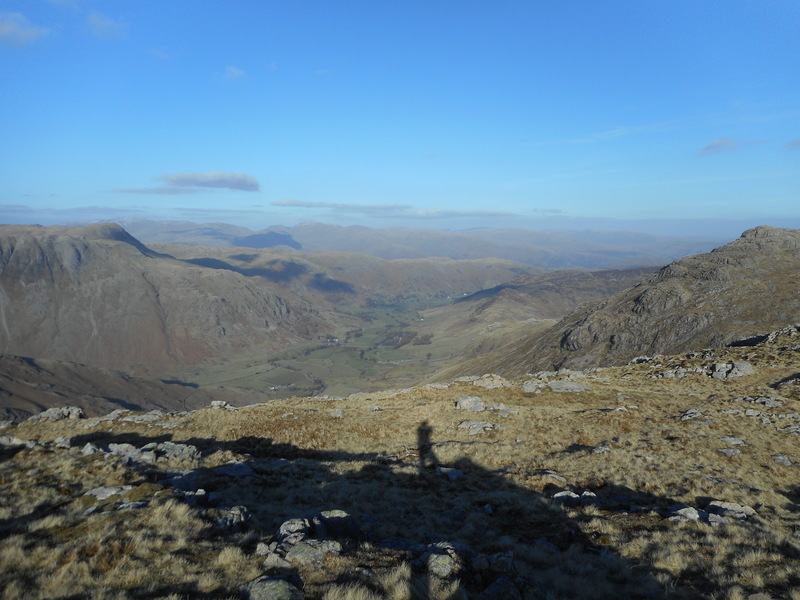 I was glad that we did as it only takes about five minutes to reach the top, and we were rewarded with superb views down into Mickleden and the head of Langdale. 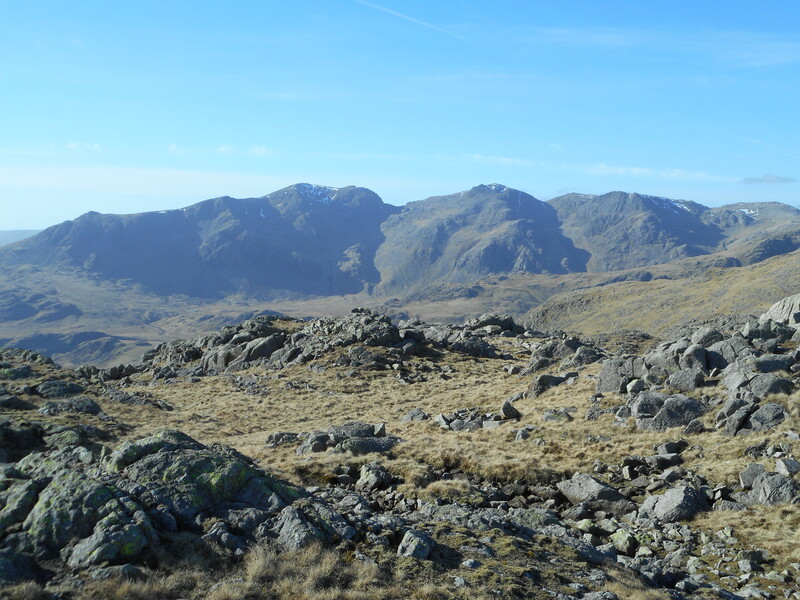 After dropping down to the delectable Angle Tarn (must make this a destination for a wild camp someday), we headed up Ore Gap towards Bowfell. 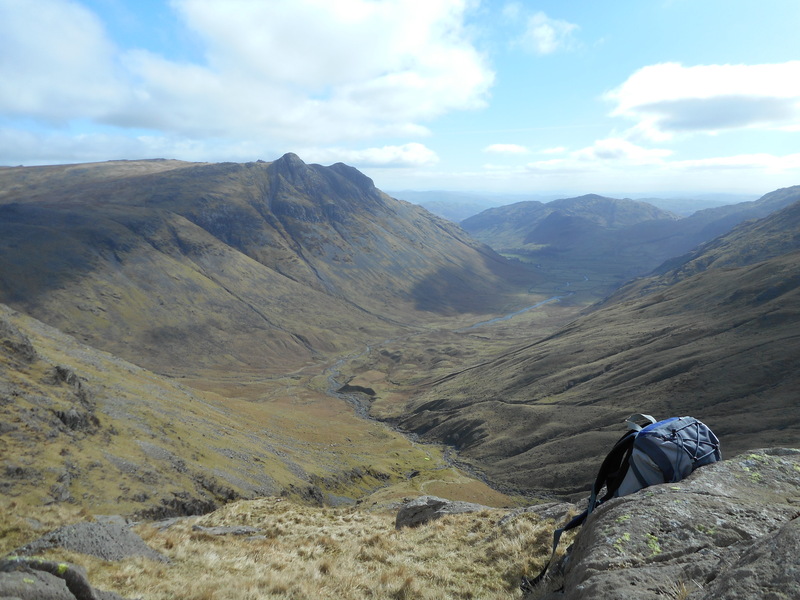 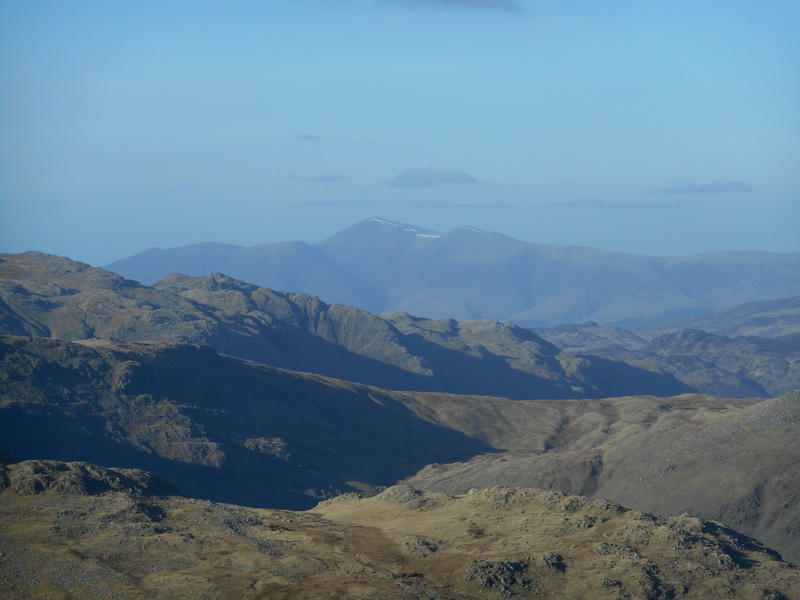 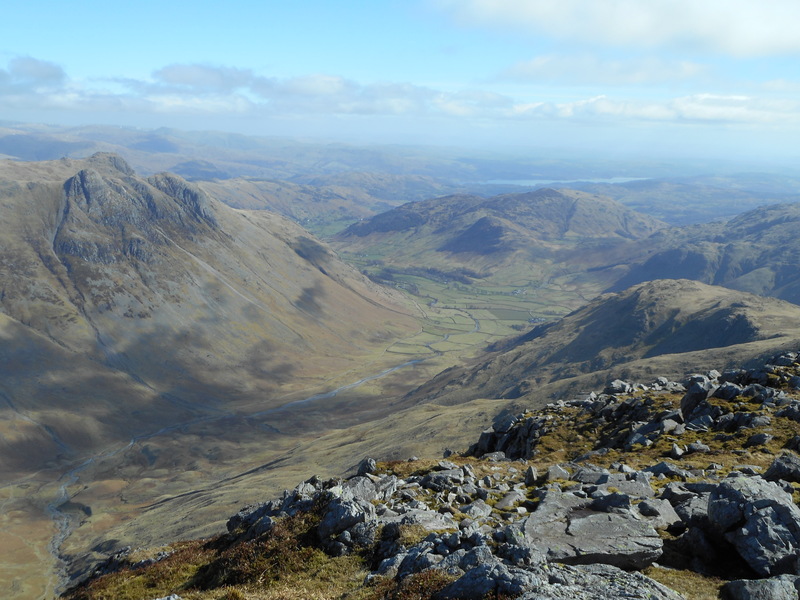 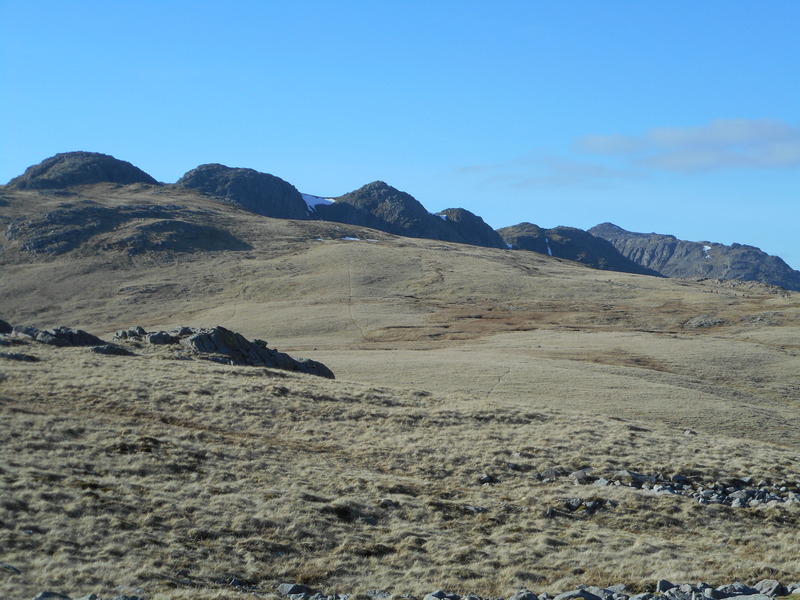 From here onwards, stunning retrospective views to the Scafells, still with snow in the gullies, were to be had. 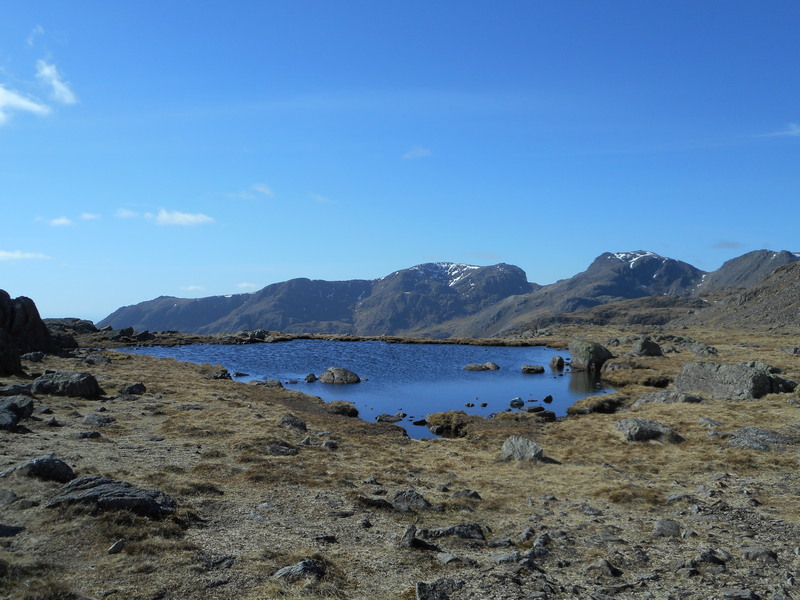 I made a quick detour to bag Bowfell North Top (2841 ft) – one of my outstanding Nuttalls – and was surprised to find a small tarn en route that was still completely frozen. 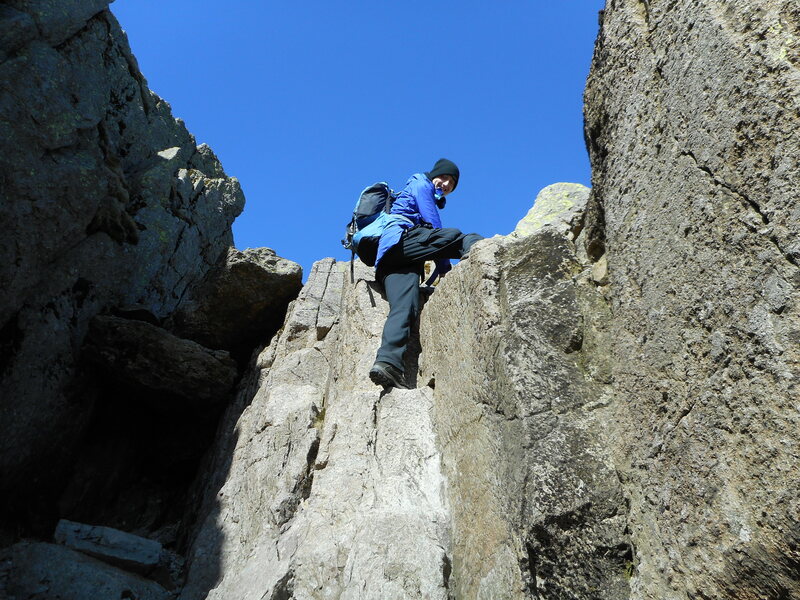 After bagging the North Top, I re-joined the others just below the main summit (2960 ft), where we were able to find a lovely sheltered spot to eat lunch. 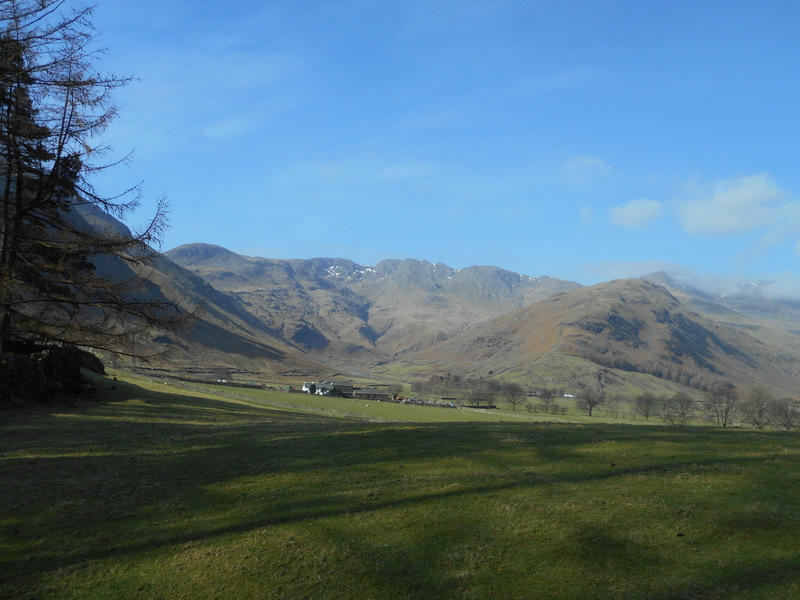 In the sun, it almost felt like summer. 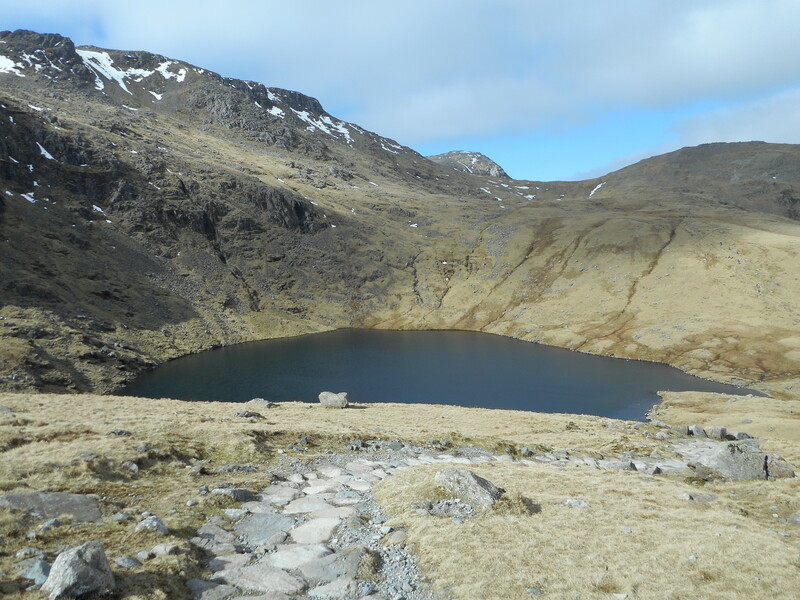 Marie left us a Three Tarns to head down the Band, as she was still experiencing some pain as a result of a broken ankle last year. 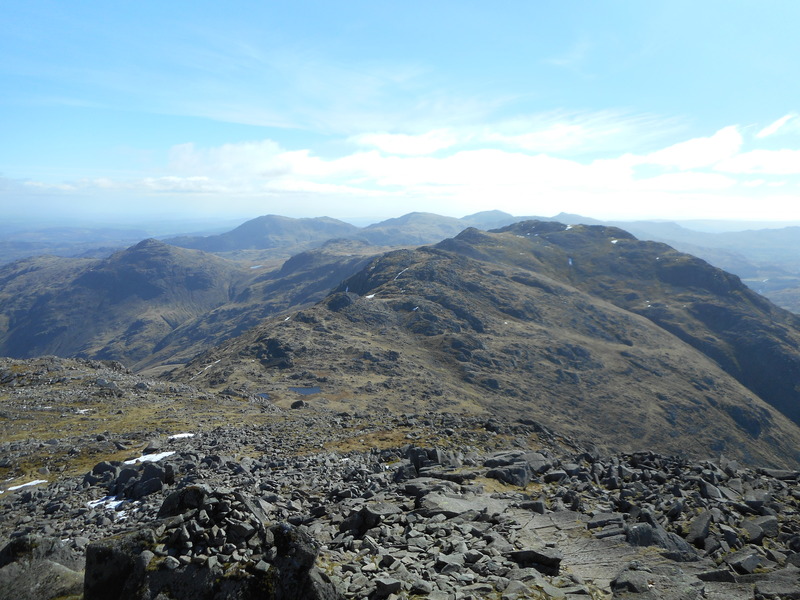 The rest of us continued over the Crinkles, though I couldn’t resist detouring to bag a couple more Nuttalls on the way – Shelter Crags North Top (2543 ft) and Shelter Crags (2674 ft) – particularly as on previous visits, I’d never been able to work out exactly which of the many lumps and bumps they were. 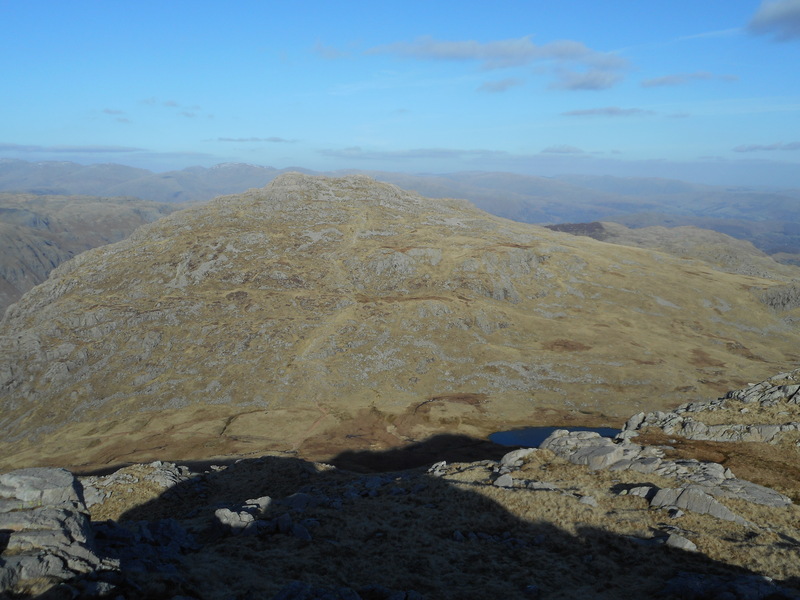 Beyond the South Top (2736 ft), I left the others to head off on my own on an extended Nuttall bagging trip. 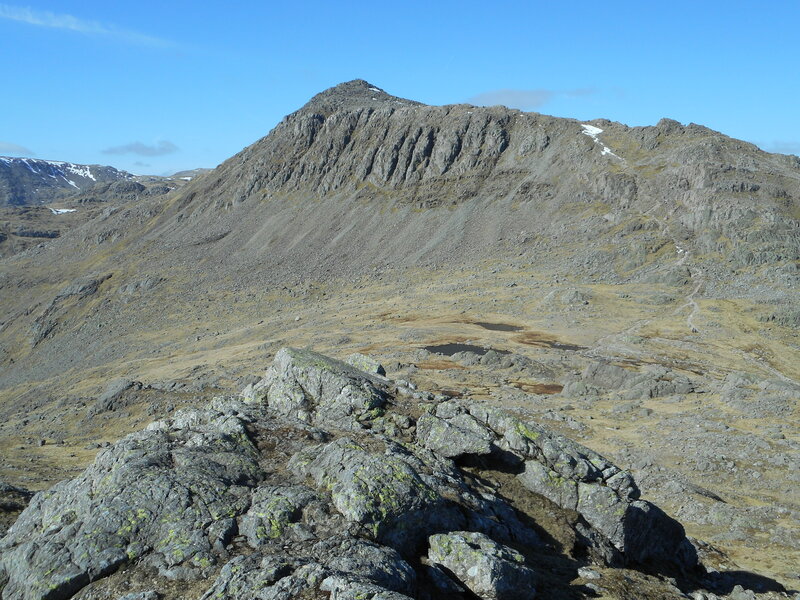 I headed first for Little Stand (2428 ft), which has perhaps the best view of the Scafells of the entire route. 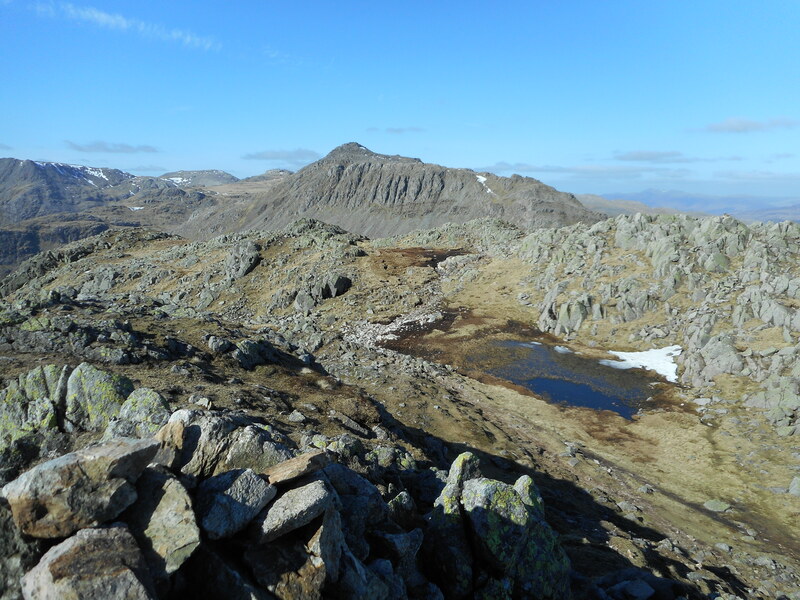 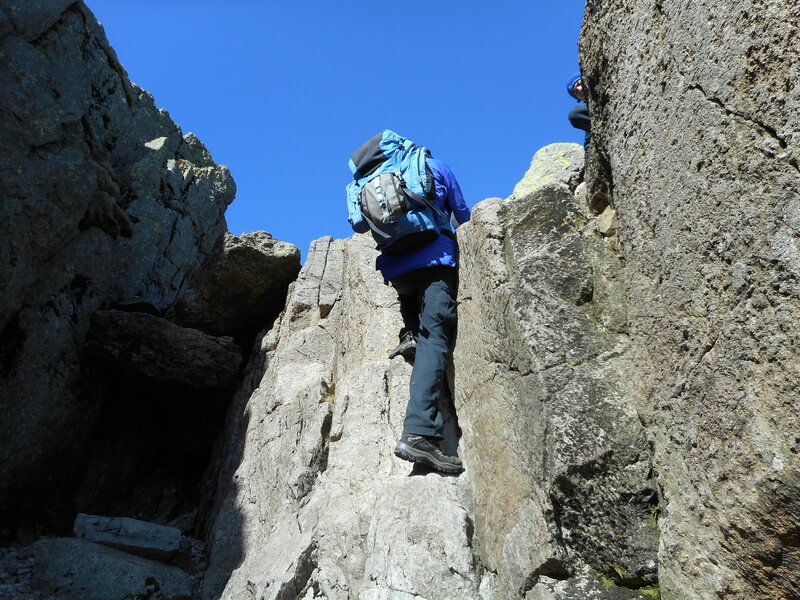 It was quite a relief to leave the heavily eroded paths behind – although this area is still really a part of Crinkle Crags, it’s away from the main ridge traverse or popular ascents and consequently sees far fewer people. 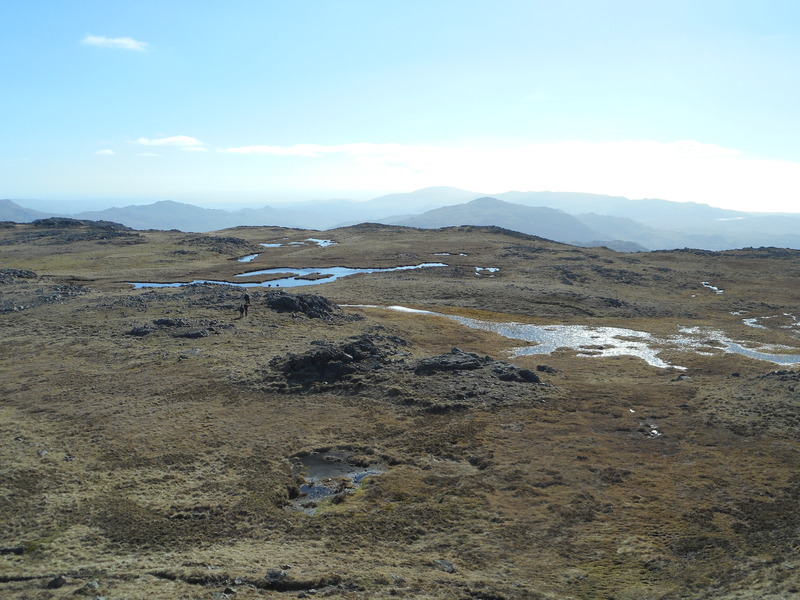 There are paths, but they are fairly intermittent, particularly in the wetter areas. 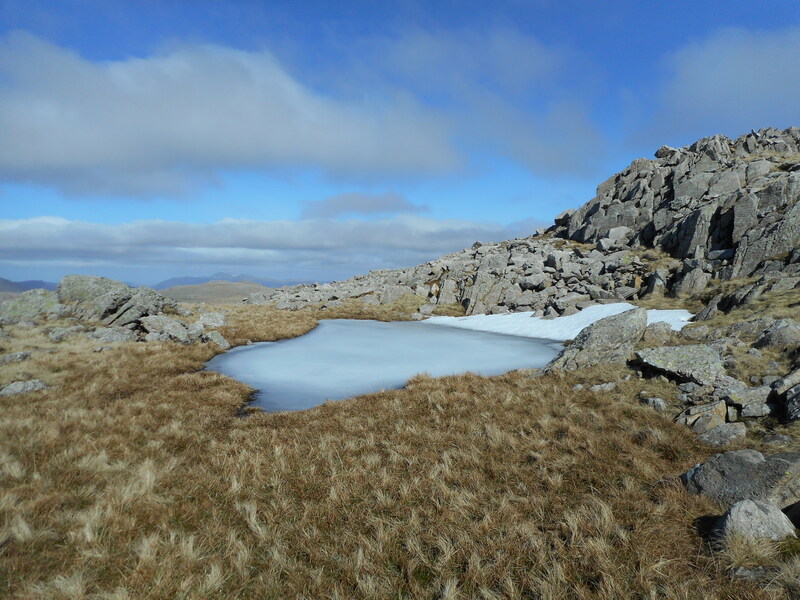 There’s still plenty of rock around, but far less than on the main ridge, so there are a few boggy areas, but also a number of attractive tarns. 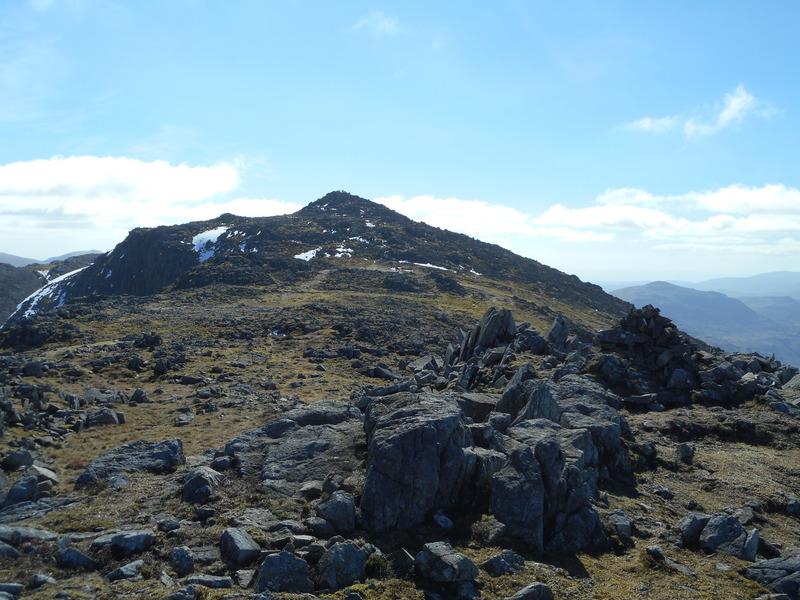 Leaving Little Stand, I headed next for Cold Pike Far West Top (2198 ft), which according to the Nuttalls ‘must be one of the most unfrequented summits in the Lakes.’ It’s an attractive top though, and I hope that this won’t be the only time I visit. 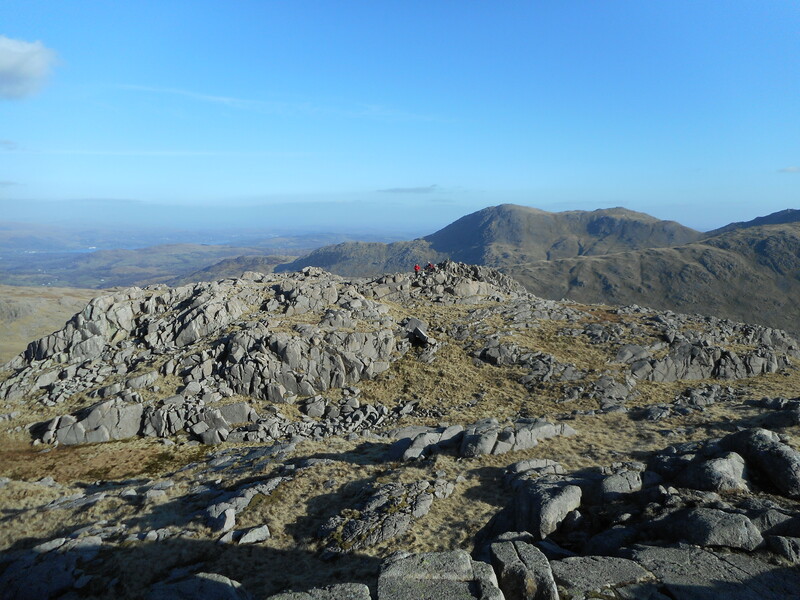 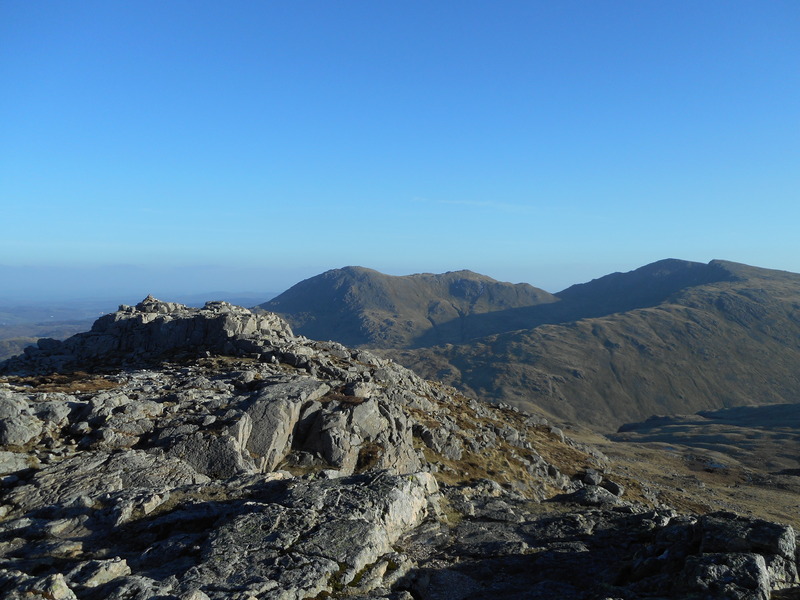 I continued to Cold Pike West Top (2241 ft), before finally heading for Cold Pike itself (2300 ft), which is a superb viewpoint for the Coniston fells and for Pike o’ Blisco. 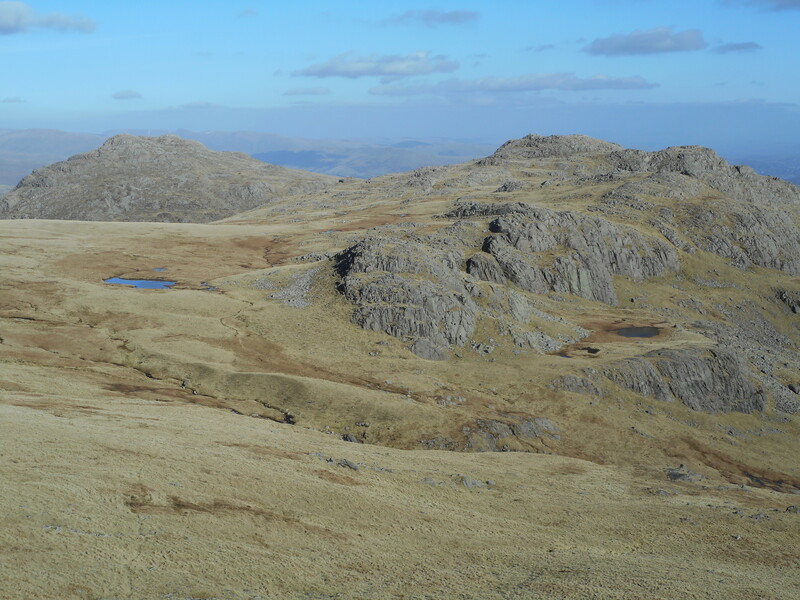 By this time, the sunlight had started to take on its softer evening qualities, which highlighted the complexity of the landscape beautifully. 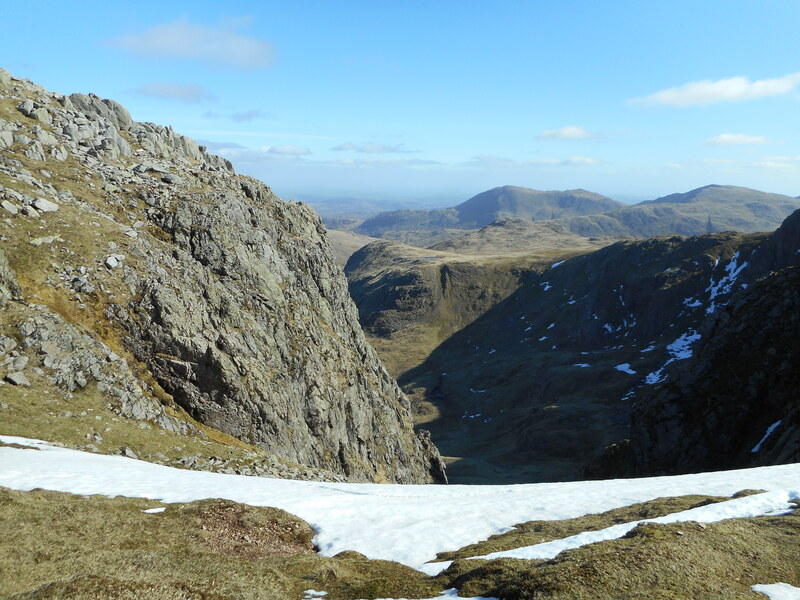 I was tempted at this point to drop straight down to Red Tarn, but resisted and headed back up towards the Crinkles so as to visit Great Knott (2283 ft), my last ‘new’ Nuttall for the day. 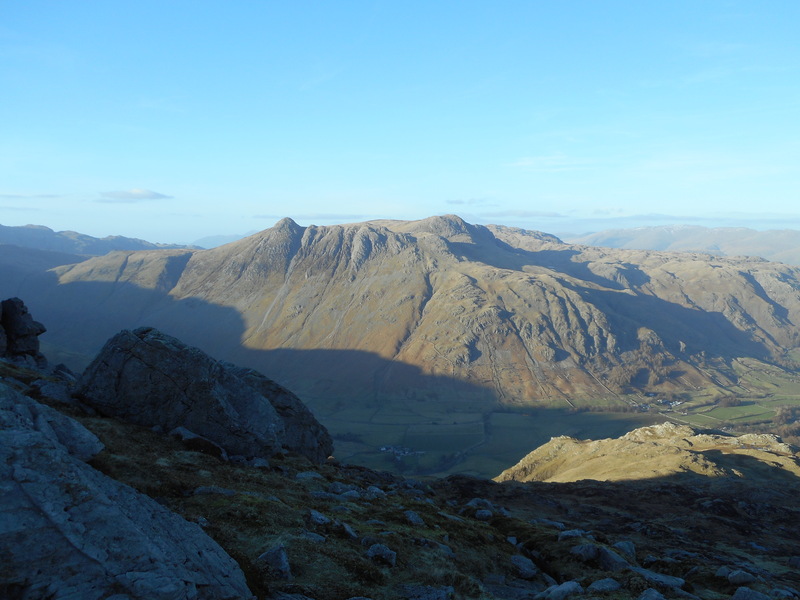 It’s surprising that more people don’t make the detour as it’s only a couple of minutes away from the main path and is a fabulous viewpoint for the head of Langdale. 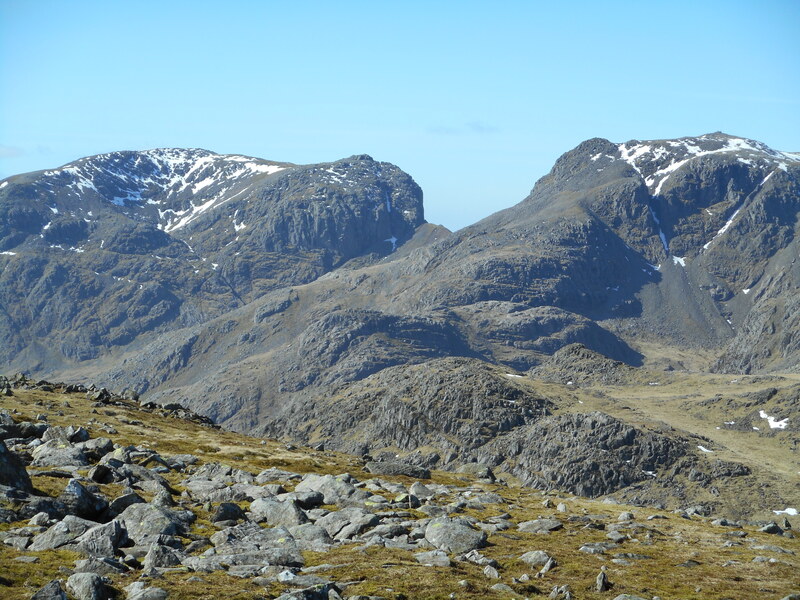 Still, I’m as guilty as everybody else, as I’d never visited it on any of my several previous traverses of the Crinkles. 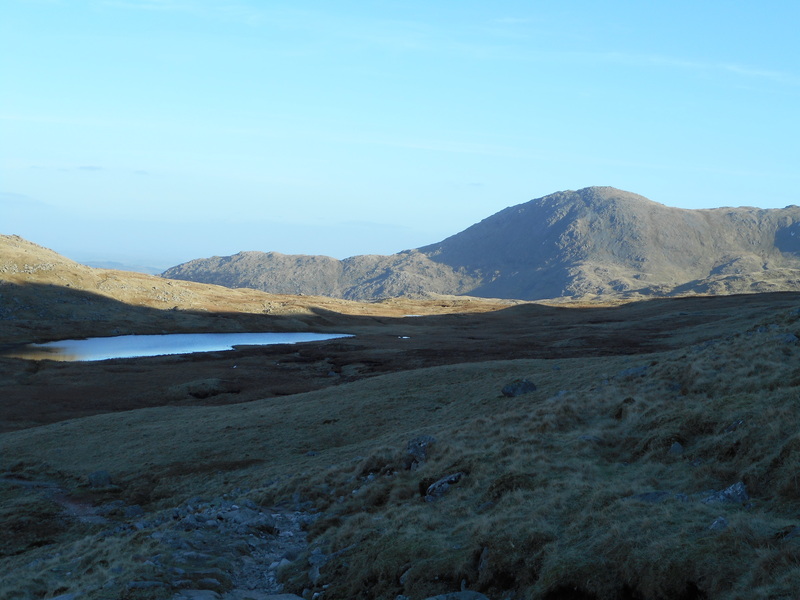 Back now on the main path, I dropped down to Red Tarn, before making my final ascent of the day to Pike o’ Blisco (2313 ft). 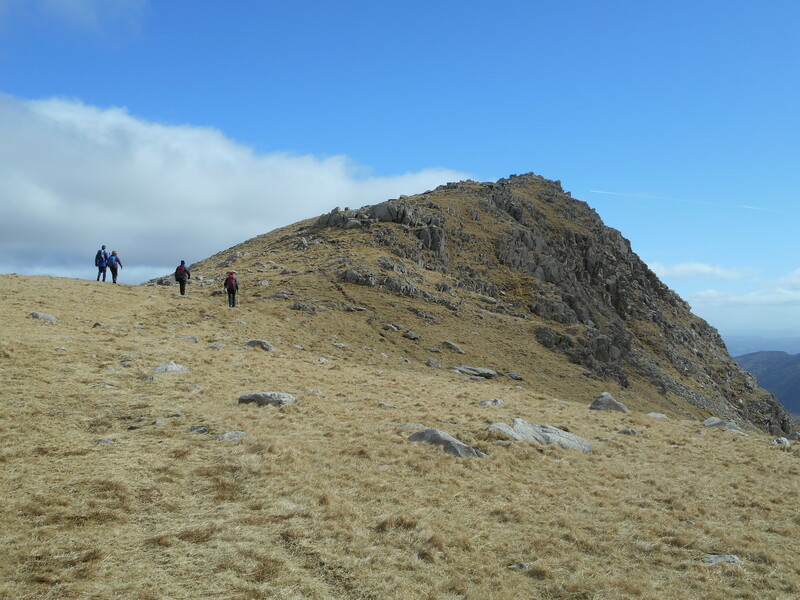 Coming at the end of a fairly long day, this is quite a tiring climb, but it’s well worth it for the views from the top, as well as for avoiding the unpleasant descent into Oxendale. 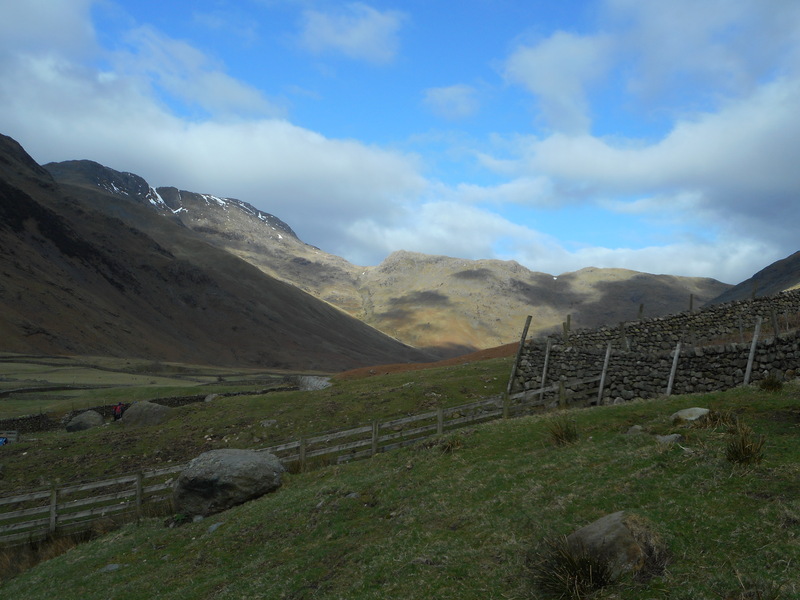 I paused briefly at the summit to admire the breathtakingpanorama, before starting the long descent via Redacre Gill back to the valley. 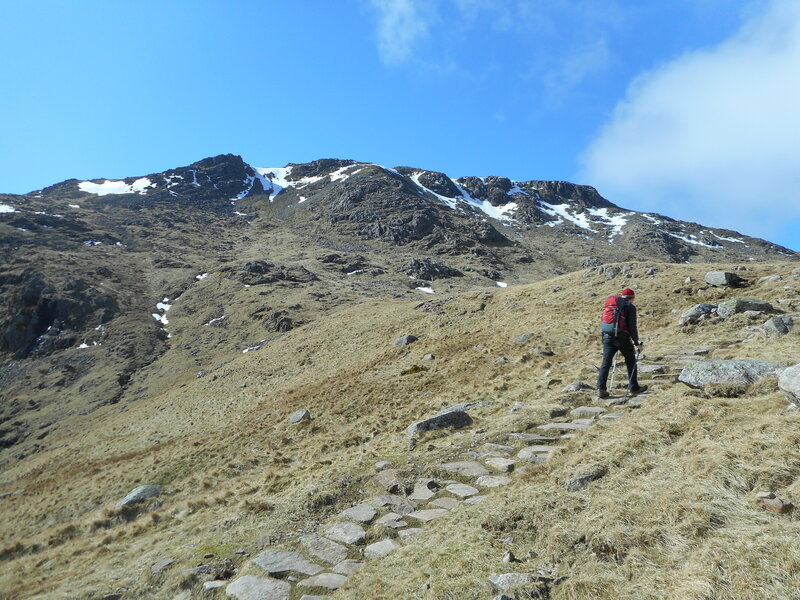 So as to avoid walking on tarmac, I left the main path where a narrow traverse path heads directly for the head of the Blea Tarn road, and dropped down to the Old Dungeon Ghyll from there via the campsite. 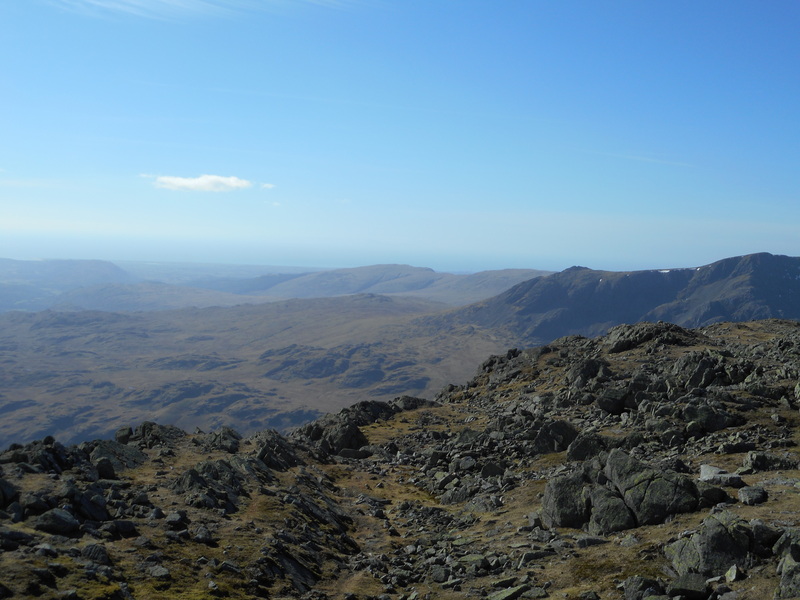 This entry was posted in Lake District on April 11, 2015 by neilsmountains.